Like the title says, classic. May have gotten this recipe from Pampered Chef, but I'm not sure. It's pretty basic anyway. Thoroughly cream butter and sugar. Add egg, milk, vanilla and almond; beat well. Stire together flour and baking powder; gradually add to creamed mixture, mixing to make a smooth dough. 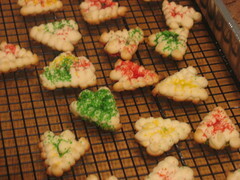 Press cookies onto ungreased sheet. Bake 10-12 minutes or until lightly brown. Cool on rack. Sprinkle with colored sugar while hot.